Recently we’ve had a number of cases in and around San Francisco where someone was hit by a train in a subway station. These tragedies — whether intentional suicides or simply accidents — have become common enough that we really should be doing something about it. It’s only fair for everyone involved. Fortunately there’s a solution that already exists: walls. Specifically, walls with sliding doors that line up with the subway’s doors, just like how elevators have inner and outer sets of sliding doors. Would you want to work in a building where the office elevator didn’t have outer doors, and instead you just stood next to an opening to the elevator shaft? No? Why should riding the subway be any different? If you’ve ever taken the driverless airport tram at SFO (or many other airports) you’ve seen this first hand: there’s a glass wall between you and the tram, and the doors only open when the tram arrives. The tram only departs once both sets of doors are safely closed. 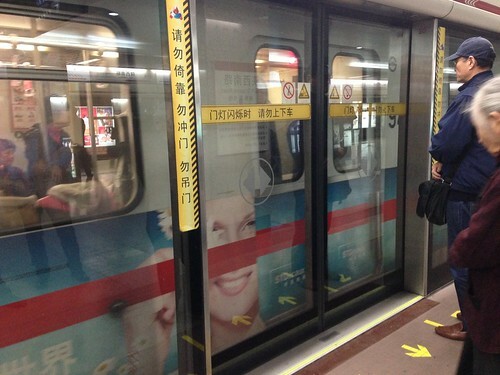 But this wall “technology” isn’t just for driverless trams — some major transit systems already have this, for example Shanghai Metro in the photo above. As the photo illustrates the yellow-tiled safety zone has been replaced by a thick piece of glass separating people from fast moving trains on the other side. Walls have a side benefit as well: stopping the wind. No need to worry about holding a paper steady or having your hair re-arranged by the wind from a fast approaching train. The good news is that BART has at least considered this recently, but so far they don’t seem to be in much of a hustle to build anything. That’s a shame for us all. @mrericsir We're working on platform walls at our most crowded stations. It's a great idea, for safety and capacity. Please keep advocating!